Chocolate wants to be the norm, synonymous with dessert itself. It wants to overshadow other desserts in the bakery case. It wants to slyly insert itself into your breakfast – whether it be by way of croissant, oatmeal, or muffin — and make you forget the beauty of those things on their own or with other adornments like nuts or dried fruit. I simply enjoy chocolate baked goods better if I make them once in a while. When I do, the desserts can be rich, they can be decadent, they can be gut busting. But when every meal ends with the proverbial “molten chocolate cake,” it just isn’t special anymore, and I certainly never want to find myself deeming chocolate boring. So, around this time every year (depending on the weather), I say goodbye to chocolate baked goods. I embrace the farmers’ markets and peruse the produce aisles. I find ways to use up the end pieces of my winter storage of chocolate and then only buy as necessary until I say hello to my fickle lover again in December. Beautiful citrus continues to paint my days, rhubarb’s tart embrace is a spring joy, berries eventually brighten my birthday month, sticky stone fruits accompany hot summer nights outside, and fall is sprinkled with apples, pumpkins, and spice. This year, chocolate went out in a BIG way. 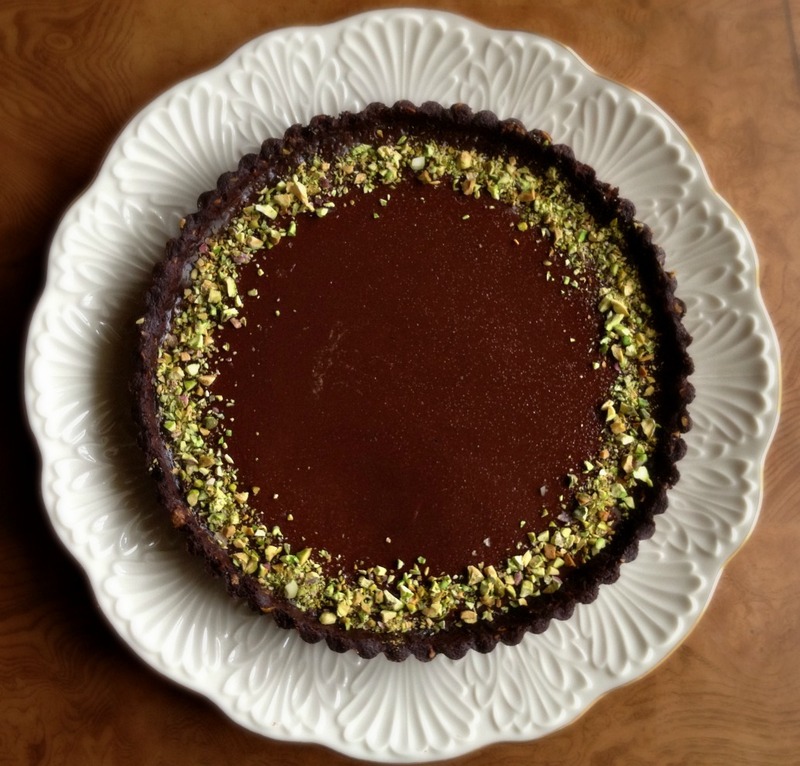 This Chocolate Pistachio Tart looked me straight in the eyes, challenging, “try to forget me now, sucker,” and all I could do was give in to its straight-shooting allure. A salty, deep chocolate crust – let’s not play, a giant chocolate shortbread cookie – is studded with crunchy pistachios. It’s spread with a paste of sugar, salt, and pistachios that has a deeply roasted flavor that brings out the nut’s complexity – a certain something that so many pistachio flavored desserts lack. A mere slick is potent. The most substantial layer is a glassy smooth milk chocolate ganache, baked with an egg so that it’s perfectly pliable at room temperature — simultaneously firm but melting on the tongue. The generous ring of pistachios sprinkled around the edges lends a gorgeous pop of color but also adds another needed textural contrast. One bite and all I could hear were smooth sounds like the voice of Etta James and the fast beating of my own heart. I was taken by its creaminess, the balance of the slight bitterness of the crust and the more mellow ganache and the unique richness of the attractive strip of pistachio paste. It’s rightfully low and sleek; a heftier tart would be too much. This is classy. So goodbye, chocolate. Miss you, I will. I made quite a few changes to the original recipe I found in the cookbook that I really think made this tart sing. My version is below. There is a version on the Martha Stewart website that’s slightly different from the book recipe I adapted to which you can refer as well. 5 ounces (142 grams) milk chocolate (preferably a high quality chocolate with a high cocoa content — 40% works best and keeps the tart from getting too sweet. The ganache layer is the star and needs star treatment), finely chopped. 1. 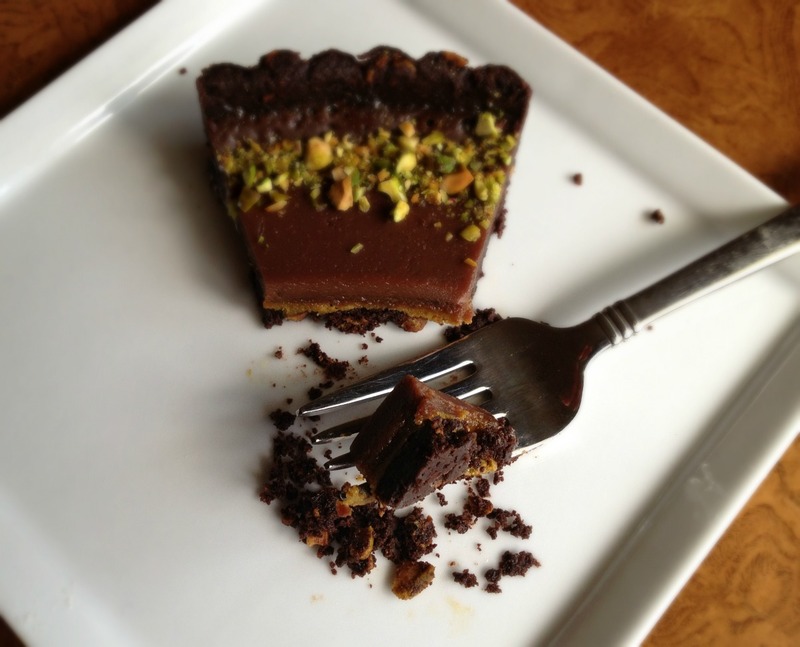 Make the crust: In a bowl, whisk together flour, cocoa, chopped pistachios, salt. With an electric mixer on medium speed, beat butter until fluffy, about 3 minutes. Add sugar and continue to beat until pale, about 2 minutes. Reduce speed to low, add vanilla, then beat in flour mixture until just incorporated and dough holds together when pressed between 2 fingers. If pressing into pan (my preferred method for this crust, but ether way works): Carefully press the dough into the pan, covering the bottom and up the sides evenly. Press it enough that the pieces cling together but not so much that the crust gets tough once baked. Freeze for at least 30 minutes, preferably longer. In the pan, the crust can be frozen, tightly wrapped for 1 month. Bake right from the freezer, adding about 5 minutes onto the baking time. If rolling: Press dough into a disk, and wrap in plastic. Refrigerate for one hour or overnight. Alternatively, you can freeze the crust for 1 month. Let the dough (from the fridge) sit at room temperature until cold but pliable, about 20 minutes. Meanwhile, preheat oven to 325 degrees. Bake crust until firm, 30-40 minutes. Let cool completely on a wire rack. Reduce oven temperature to 300 degrees. On a lightly floured surface, roll out dough to an 11-inch round, 1/4 inch thick and fit into pan. Patch tears and trim to the rim. Freeze for at least 30 minutes, preferably longer. In the pan, the crust can be frozen, tightly wrapped for 1 month. Bake right from the freezer, adding about 5 minutes onto the baking time. Make the filling: In a small saucepan, heat cream and milk. Pour over chocolate in a small bowl. Let stand 2 minutes. Slowly whisk until smooth. Let cool 10 minutes, then stir in egg (without incorporating air!) until combined. Spread pistachio paste evenly on the bottom crust, pressing firmly with an offset spatula until flat and smooth. 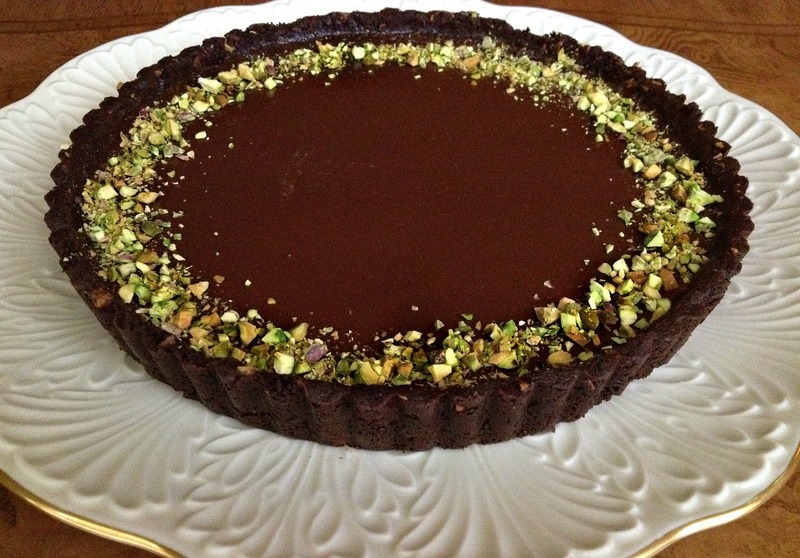 Place tart shell on a rimmed baking sheet and carefully pour in the chocolate filling. Bake until just set, 30 to 35 minutes. Let cool completely on a wire rack. Sprinkle tart with chopped pistachios. Tart can be stored in the refrigerator for up to 1 day. Take out 45 minutes before serving. Serve plain or with a dollop of lightly sweetened whipped cream. In a food processor, purée pistachios, sugar, and salt until mixture begins to clump together, Add oil, and purée until very smooth and paste like. This could take 10 minutes or more depending on your food processor. This is literally my idea of heaven in tart form! I absolutely adore the combination of pistachio and chocolate and can imagine that layer of slightly salty paste is incredible (I made creme brulee with a little layer of pistachio nut butter once and it was so good, but anything with chocolate would surely beat it). I wouldn’t describe myself as a chocoholic, but like you I do absolutely love it in desserts. You’re right though – it has to be limited, as, like most things in life, you can get bored if you have it too often! I’m kind of the same way. I do love chocolate, but not in a chocoholic kind of way. 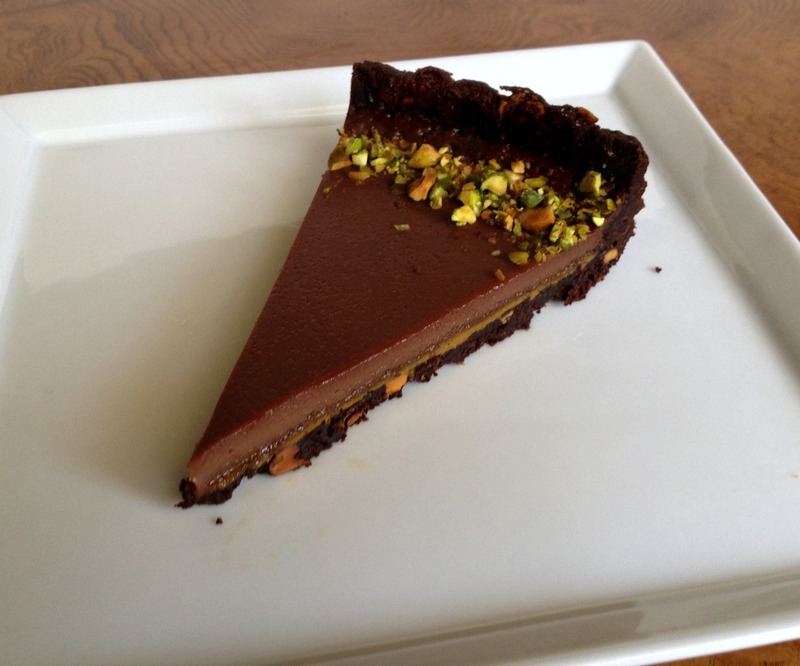 I made this chocolate tart for Christmas in 2010 (Pic: http://evolvingepicurean.blogspot.com/2011/01/christmas-recap.html) and while it was delicious, smooth and so chocolatey, I could barely muster a half piece. I have a hard time gorging on that much chocolate. But I do enjoy it. My grandma, on the other hand, slyly ate almost an entire piece by herself….all 95 lbs of her. She looked so guilty when I exclaimed in front of everyone that she was sneaking bites until it was gone. How do your pastries always turn out so perfect looking? Aw, that’s too kind. A lot of practice, I guess. Your tart looks equally delicious! What recipe did you use? My grandmother only eats white chocolate and doesn’t like chocolate desserts, so I can never make something like that for a family gathering. Chocolate is usually my least favorite dessert flavor. But that tart might make me change my mind! Chocolate with salt and pistachios? Oh my. beautiful! you are right, this is one classy tart. This is gorgeous! I love pairing chocolate with salty things. Otherwise, I find it a little too sweet sometimes. Delicious! This is stunning. I definitely consider myself a chocoholic, however I do give it up mostly in the summer for citrus fruits and berries and stone fruits. Looks like you picked a great recipe to usher in the chocolate-less season! I love this post. And wow! You are amazing – giving up chocolate. It has it’s claws in me; I just cant’ say no. Chocolate baked goods. There is no way I’m giving up “chocolates.” No way, no how ;). I know so many people who would love this. I’m going to have to make it. And that could happen any time… I never give up chocolate. This looks absolutely incredible. I could never say goodbye to chocolate!! what a way to go out ;) this looks absolutely amazing! !